What's Wrong with this 401k Asset Allocation? Home » Financial Planning » What’s Wrong with this 401k Asset Allocation? Can you point out some of things that are wrong? I wonder how many people are religious about contributing to their 401k plans, but make poor choices about investing that money. Should You Invest in Vanguard Target Retirement Funds? Are Target-Date Funds Right For You? @Charles — Sorry I didn’t respond sooner. As a general rule of thumb, I recommend staying away from touching your retirement money for short-term needs, unless you absolutely has to. I’d first start by looking at what expenses you can cut immediately to improve your cash flow — i.e., cable, cellphone, and other kind of subscriptions. Secondly, if you do not have a job, your mortgage should be your top priority because it’s a secured loan — i.e., you could lose your home if you don’t pay your mortgage. I’d pay the minimum on the car loan and credit card to stretch out your cash reserve. If you still want to go ahead with the conversion, it’s best to wait until 2010 to convert to Roth IRA because you can wait until 2011 and 2012 to pay taxes on the conversion. I got laid off last month. Should I roll my 401K over to a Roth IRA and then take out the money. This to pay of my car/credit card have some money for mortgage and maybe put $5000 in individual stocks? 36 with only $42000 in 401K total. The comments above are right about why not to invest in a 2020 retirement fund and bond fund. I do not like the stock fund by their own company because of the MCI and Enron and other bankrupt companies. @Ryan – welcome to Moolanomy. Then wouldn’t it be better to have more money in International stocks, since US stocks would be worse off during a recession? I don’t know the answer, just curious. Unless the company shares were awarded to the employee and not purchased by them, there is way to much weight there. International has had a great track record, but might be reaching a peak there. This person might want to consider scaling back there. Especially if the US is entering a recession and the market tanks, it will effect world markets. @shadox – Agree. I also think some people are banking on their companies being the next Google or Microsoft. @Ray – I thought TD Ameritrade was going to buy Etrade, then all the sudden…bam. How about those poor people who worked for Etrade and decided to put most of their money in their company’s stock…more than 50% plunge recently…. You would think that people had learned their lesson of not gambling their financial future on their company stock after the ENRON fiasco. But no. It seems that sometimes people only learn from personal, painful experience. Wow, there are a lot of great answers here. Thank you everyone. @Raymond – From your comments, I probably did over react. @KMC – We did talk about Enron. Funny you should mention. I forgot about Worldcom. @Russ – I doubt it. I don’t think he’s that savvy when it comes to investing. @Kev – Yes, our TR funds are Vanguard funds. We are not forced to buy company stock, but it’s an option. Good question about investment choices; ours include: large cap active/index, mid cap active/index, small cap, active/index, international active/index, bond fund, income fund, REIT fund, company stock fund, and about 10 target retirement funds. @SJean – I think risk tolerance one thing he has to learn and find out — good point! Do you think 25% international is risky? I am at 28%. I think 28% is reasonable because U.S. is certainly not 75% of world economy and there’s no reason to believe that the U.S. will outperform the rest of the world in the long-term. @CHM – a lot of good points in your comment. Thank you. @Nicole – I agree with everything, but I would challenge that 25% international is not too much. @Mrs. Micah – Yep on too much company stock. Personally I used to have 5% in company stock, but now I am down to 0% (as much as I love my company). I can see investing in company stock as an attractive option for people who work for small companies that can go big one day — i.e., Google, eBay, Microsoft way back when, etc. ; but not for people who work in Fortune 500 companies. I think these folks are better off investing in the broader market. @Patrick – Personally, I am also guilty of that round number syndrome. Oops! * I explained to him that he should be looking at target retirement 2040 as opposed to 2020, if he wants to go that route. * I asked if he thinks our company will do better than Google, Microsoft, GE, etc. And, told him that in the rare event that our company goes belly up, he could lose his income and wipe out a quarter of his retirement fund at the same time. * I gave him an alternative asset allocation to start off with: 30% large cap index, 30% small cap index, 30% international, and 10% bond, or simply to go with 100% target retirement 2040. However, I cautioned him that he should learn more about investing and then adjust his allocation according to his goal and risk comfort level. I’m a little late to the topic, and I generally agree with most statements made by the other commenters. So I will go in a slightly different direction. The good news is that he is investing, and with a little education, he can begin to make investment decisions based on targets and goals, vs. the “look” of the pie chart. I hope you can point him in the right direction for some solid investment allocation information. Well, it’s just not properly balanced. A target fund is structed to be a full service mixture of funds that changes over time, so it is weird to mix it in with a whole bunch of other random investments. I don’t think a target fund belongs in here at all (unless it is the only thing in the 401(k)). And as others have mentioned, it is too conservative, unless your friend is in his 60s or something. Well, wayyyy to much in company stock. Point out that he already has major “stock” in his company–his job! The 2020 fund probably includes a lot of bonds too, making the fund even more conservative. I’m conservative myself, but 25% should be find for someone who’d 30, you wouldn’t want the extra 7-10% or more that’s found in the 2020 (7-10% of the total portfolio not the 2020 fund, which I’m assuming is at 30-40% bonds). There’s also almost no domestic stocks except for his own company. If he wants something simple, then the Couch Potato Portfolio would be better than this–maybe at the 75% S&P index/25% bond index for now and gradually shifting to 75/25 the other way. Or he could get a bit more creative and add some midcap indexes, US stocks, etc. Johnathan hit the nail on the head, as to whats wrong. Your friend could be making a a big bet that the US stocks are going to be slow growing over the next few years, and by allocating like he has it he will see better growth with the international funds, and bonds. Such a speculative allocation is not a good strategy for a 401k designed for long term growth. I would consider cutting keeping a lower percentage in bonds too since the lifestyle funds usually have a bond component to them. At first glance I think it’s obvious that there are problems with his allocation. For someone in his early 30’s you immediately question the target 2020 and the over sized allocation into bonds. Generally speaking, anyone in their 30’s, with 25 yrs+ till retirement should have more of an equity based portfolio. But we don’t know his risk profile…and its hard to figure it out from the current allocation. Where’s the diversified exposure to US large, mid and small (growth and value)? I don’t think the 25% he has in company stock satisfies these missing pieces. But I think kev brings up a good point too. Some companies only match in company stock, it’s cheaper for them to do so. This may account for the 25% he has in company stock because he has no choice. It’s an odd allocation. Is he going for risk or conservatism? It’s hard to tell. A target retirement fund seems like a good option, but not if you are going to add on a bunch of ther funds in a seeminly thoughtless way. Why 2020? 25% international is “risky” but if that is a conscious choice, then so be it. 25% in the company stock seems like too much wrapped up in his job. 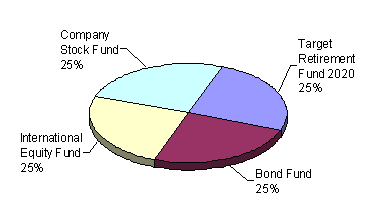 When your allocation makes a perfectly even pie chart, it makes me wonder…. Does your friend have a CHOICE in whether or not to put a chunk of his 401k into company stock?? I ask because until very recently, the company I work for didn’t give us a choice. Their match was given to us in company stock. This meant that almost a quarter of my 401k was in company stock (scary, I know). Now, if your friend is in the same predicament, perhaps that is why he chooses to put so much of his 401k into bonds and a conservative 2020 fund? He recognizes it is very risky to have so much of your 401k in company stock, so to offset this risk he owns a higher percentage of bonds than he would normally. 1) I’m some years younger than your friend, and I keep 10% of my 401k in bonds (I have a relatively low risk tolerance). But even *I* consider your friend’s fund to be too conservative. The Vanguard Target Retirement 2020 fund is 28.5% bonds (even if his fund is not with Vanguard, this percentage should be close). This means that in addition to 25% of his 401k being in bonds, more than a quarter of his 2020 fund, which comprise another 25% of his 401k, is in bonds. All totaled, approximately 1/3 of his 401k is in bonds. For someone in their early 30s – unless they have a very low risk tolerance or will retire very early – this is just too conservative. 2) Unless there are circumstances beyond our knowledge (Example: his company stock is purchased via an employee purchase plan where he is able to buy company stock for 85% of its market value), that is too much company stock. 25% in company stock?!? Has your friend ever heard of Enron or Worldcom? Too much money in bonds. Probably less money in the 2020 fund would be appropriate. 1) Unless he plans to retire in his early 40’s, a 2020 Target Retirement fund is “probably” too conservative and not weighted heavily enough in stocks. 2) 25% is “probably” too much exposure to bonds for a 30-year-old unless your friend is more concerned with obtaining a steady income (not growth) from his investments. This likely isn’t the case unless he is made of money, and already has enough stocked away to last his entire retirement. 3) 25% is “probably” too much exposure to a single stock, even if its your own company and you legitimately believe that its a good one. All in all, though, its unlikely a disaster would wipe out his retirement funds. It just means a little sub-par growth. I think you over-react a bit and hope you didn’t express your horrified remarks to your friend, thus sending him into a panic and make decisions based on fear.